The order of events must have been "stole a leaf", then "tried to poke a child to death with the same leaf, leaving the child uninjured". Either way, it doesn't reflect well on Ada's performance as a fearsome beast that's supposed to kill people. Sorry about my last reply. Was anecdotal. Here's the arena test on unmodded vanilla DF 44.12 As an arena test, there are no conditions affecting rolls, whether visual, buff, or debuff. Anyone can run this test in the arena to see how single action manual dodger thwarts (grip breaks) wrestling grabs for themselves. A process is only useful if any of us can repeat it. Side 1 is Giant 1. The only stat you give this giant is grandmaster wrestling. We give Giant 1 grandmaster since we want them to make successful roll-to-grab. No equipment. Side 2 is Dwarf 1. Give this dwarf novice fighter/observer/dodger. No equipment. NPC AI controls Giant 1. - You wait for Giant 1 to approach. If the Giant 1 is not on an adjacent tile use the "." period key to pass 10 ticks, until you are on adjacent tiles. 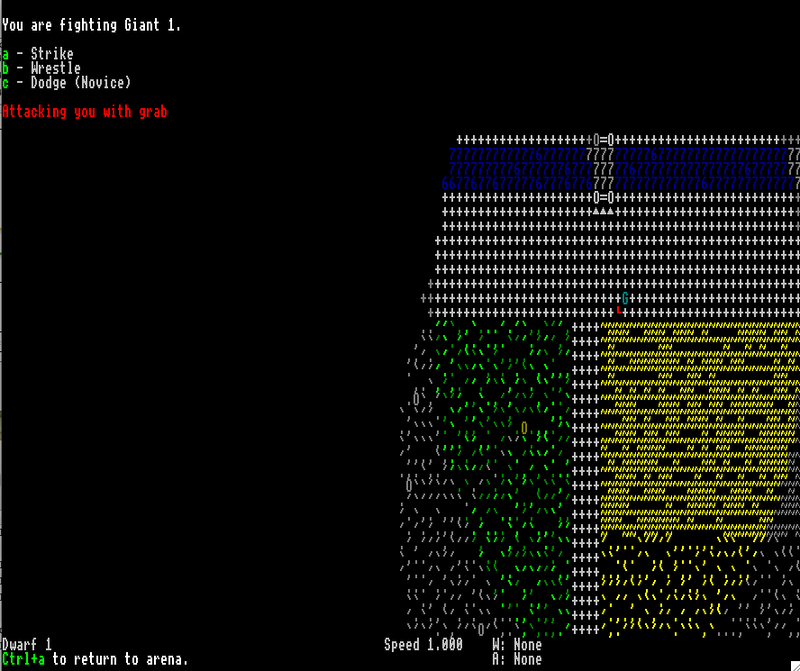 - Once on adjacent tiles, use the "," comma key to pass 1 tick until Giant 1 features an attack. - You respond to whatever attack by Giant 1 by manually dodging away, resulting in 1 tile separation between you and Giant 1. Giant 1 attacks you but You jump away. (Your successful roll-to-dodge message). Giant 1 grabs you by bodypart with bodypart. (Giant 1's successful roll-to-grab message). Giant 1 misses you. (Giant 1's roll-to-hit failure message). This message won't appear since you are initiating a manual directional dodge. Size and strength don't factor. Dodger is and has always been overpowered and when paired with (2 tick prepare:2 tick recover) quick attack, you end up achieving far too many ends with one action. I think Geño cloned himself. I had gotten to the dingo's den, but he killed it almost instantly. I left him in the nearest hillock so he didn't steal all my glory. 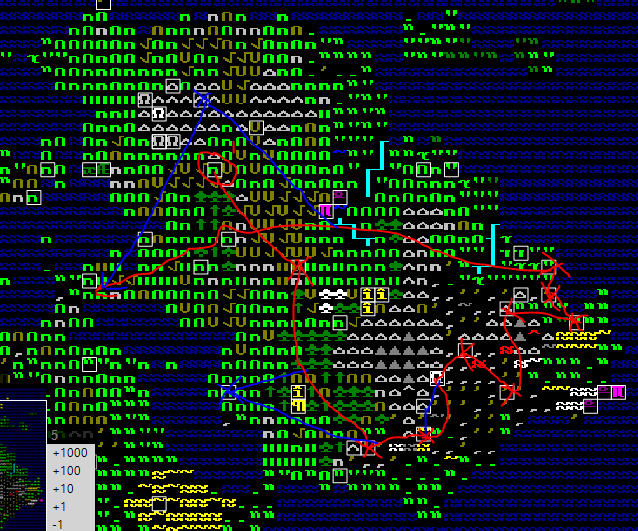 I was almost to Ada's lair when giant dingos attacked and murdered Mospar, my only protection from bogeymen. I rushed back to Limbfrills and you know who was there? Anyway, we got to Controlflew. It was literally a hole in the ground. I saw the great giant; I ducked and dodged and weaved and stabbed. I got nasty hits on it's lungs and guts, probably giving it terrible debuffs. I finally killed it. I butchered it, hoping to get some epic giant bone jewelry. No avail. 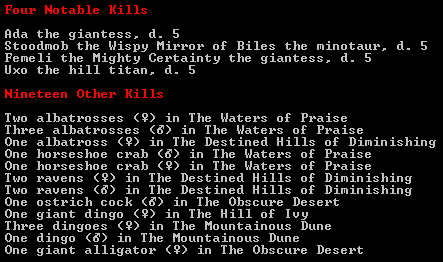 I just took it's skull as a trophy, nearly split in half from the killing blow, being cloven asunder. I then named my pike "The Misty Ages". Small problem. Geño disappeared, and I can't find anyone else willing to join me in the two human towns to go kill a nearby minotaur. Big suprise. 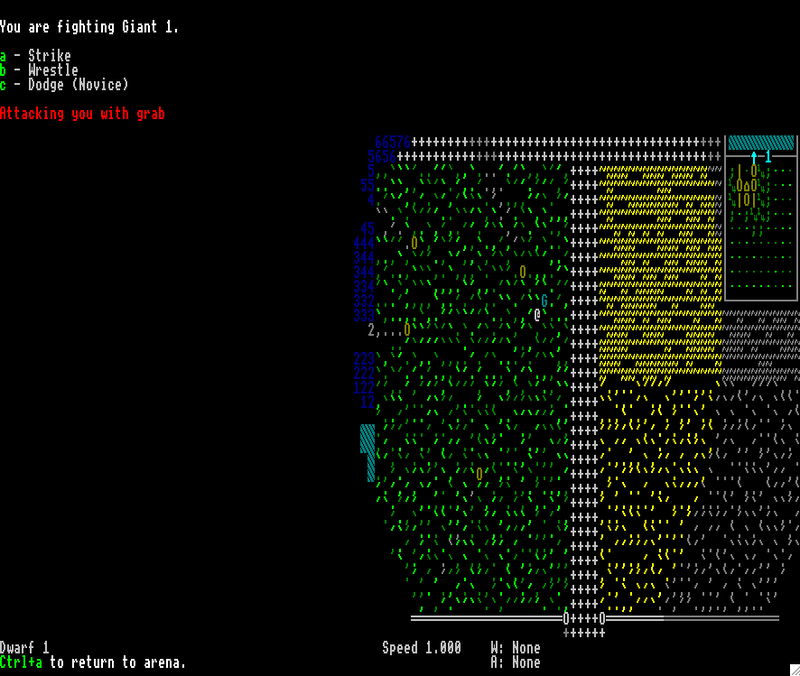 I feel like the dwarven civilization is too far away to get to in a single day, and I can't risk getting jumped by bogeymen. Any advice? Nobody in the meadhalls was interested? There's usually a soldier or two. Failing that... well, certain biomes are generally bogey-free: you can stop at any mountain, desert, or beach and sleep in (relative) safety. If there's not even any of those between you and your destination, you could maybe build a shelter halfway. Cut a tree down, stuff a few logs into your pack, travel for a half-day, then build your campsite before it gets too dark. You don't need any walls, just a one-tile ceiling to stand under. The night trolls can still find you, but bogeys won't. I got EXTRMELY LUCK as when I loaded in, I was standing right next to a axeman named Zapas. (Tip: Don't get too attached to him.) 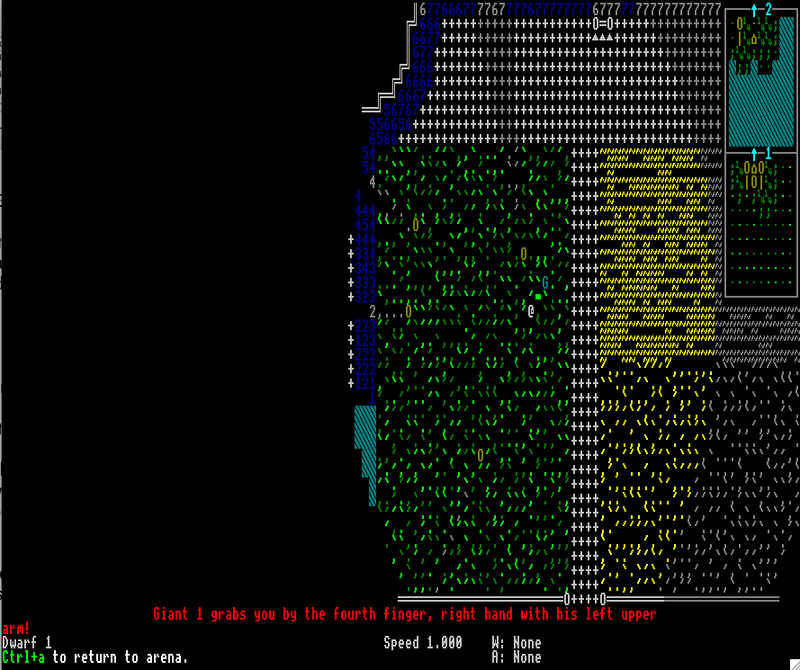 We headed towards the nearby hillocks and got a dwarf drunk named Kubuk Ragerush. That apparently worships a god of war. We searched the nearby countryside for the labyrinth and found it almost immediately. I left Kubuk at the nearest hillocks so he could heal. I picked up two more drunks and headed north to the last beast in the area, another giant. We were so close, but then got ambushed by dingos. They killed one of them, but the other was mostly fine. I butchered one, getting all the usual things but also 'dingo sweetbread.' What? Anyway, the lair was found. 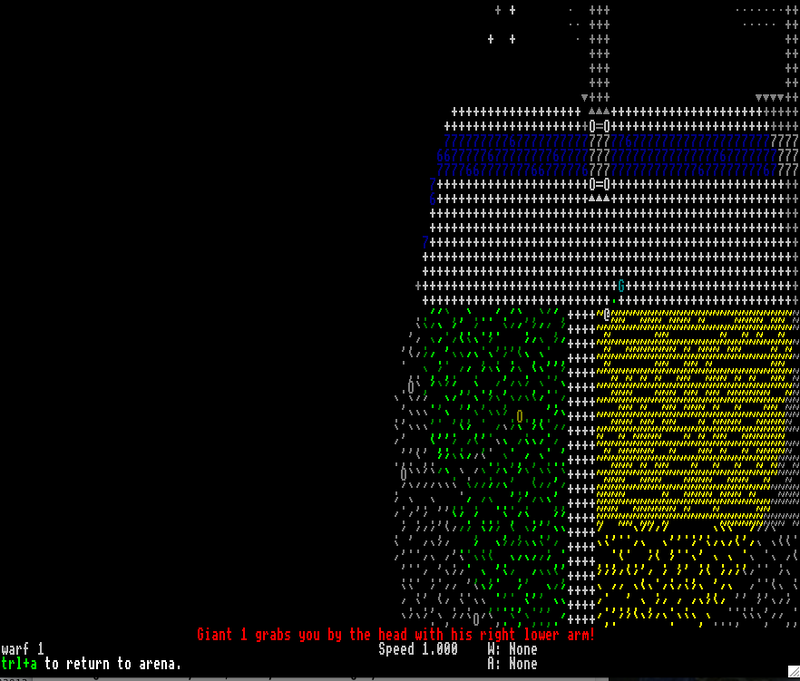 I left the bodies of Zapas and the drunk in the lair, and went off to the ocean. We got ambushed by this. Just so you know, that is a blacktip reef shark. Just like the ten others that ambushed us. That was the last beast in the area, except for a hill titan. I'm trying to figure out what it is so I don't accidentally stumble onto a steel titan. I'm going to save, then go to the shrine. If I die, I'll savescum and ignore it. I'm pretty sure I gave him the superpower of teleportation. I got to the shrine. I have no idea how to fight this thing. It would likely die if I hit it, but I can't because I'm webbed. In any case, I went to kill a "man of evil". I slept before I went in, and woke up surrounded by keas. I went up the mountain, and simply COULD NOT find the dang entrance. Oh hey, this thing again! Ugh, webs are nasty. Melee against that thing is probably going to get you killed. Skill up throwing, maybe, and hurl some bolts at it. I've heard minecarts make you immune to webs. It took a while, but after I severed some nerves It simply couldn't get a hit in. It never bit me, so I don't have to worry about venom. My kill list is looking pretty good. I know head down to the minotaur. 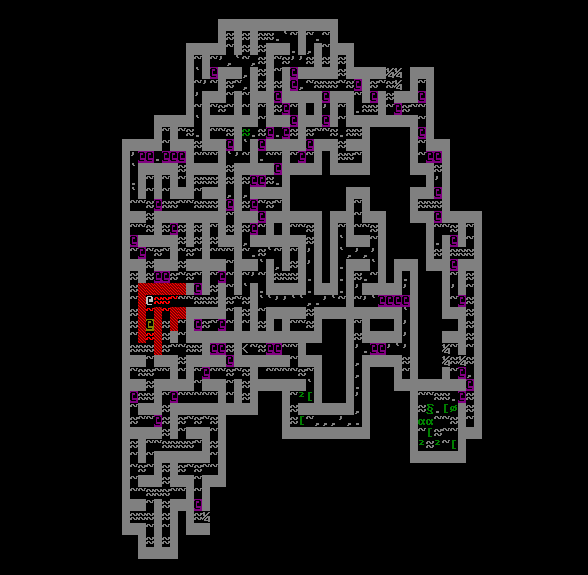 I find the dragon's cave that is next to the minotaur, but, for obvious reasons, don't go inside. This minotaur is obviously tougher than Stoodmob. I've had to savescum at least three times, and I still haven't put a scratch on him. I'm going to have to skip this one. Can't dodge the web stream, but you can jump over it. If speed 1.000 = travel at 10 ticks per tile, you want to know how many tiles it takes your character to hit your full sprint, because you want to be at full sprint at the 6 tile mark. This is where you'd jump (over) to trigger web spray. Your landing tile is better if there's 1 tile separation between you and the webber. If you choose to jump to an adjacent tile, you run the risk of either landing in a web (=dead), or on them (as during your jump they may opt to move onto your destination tile = they dodge out of your flight path and eat up 6 ticks of that cool down period). Higher risk = more cool down. Lower risk = less time. From a gross motor skill perspective, just assume you have maybe 15 ticks to kill this thing, which is like 3 swings versus a creature with level 6 dodger. Pretty much this means you want to have a way to get more swings, have them be more accurate, and be able to do as much damage as possible. You get more swings if you ground them (they fall over = somewhere around .323 speed) by either throwing stuff at them when you are 21-25 tiles away, or by shooting them. I play archer-ranger characters, so from a roleplay POV they just shoot the webber until it's dead. But for folks who want to risk melee, ground them to reduce their rate of action. Accuracy = high skill weapon versus lower skill dodger. Since a titan/FB has a level 6 dodge, you really want at least baseline legendary weapon skill. Aside from weapon type vs bodypart targeted, damage is based on your attributes and size. 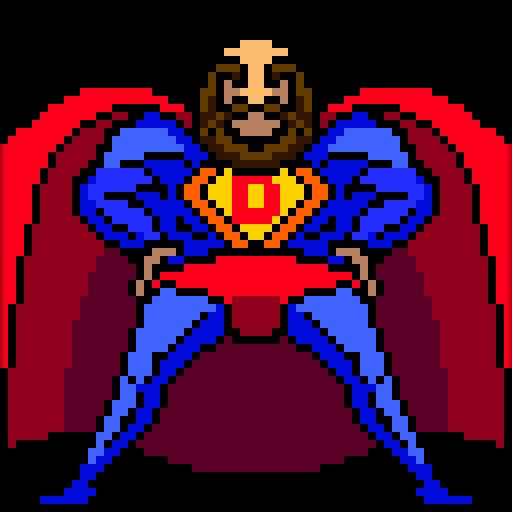 If you wanna munchkin it out you'd want a large human w/superhuman STR. Better if this human started with superior at character creation so his/her floor is as high as possible. Best weapons: pick, whip, axe all at legendary so you can choose depending on the titan's material type, and body setup. Since you have a coral blob, it's prolly steel pick. As you can tell, a webber is really an end/late game melee combat that's high risk/very crappy reward. IMO, it's more of a problem solving activity than a useful one. I think I know why this minotaur is so much tougher than the other one: 1. It isn't, and 2. Zapas. Zapas drew a lot of the attacks and also landed a lot of hits, letting me finish hum off. So here is the new plan: Skip this minotaur for know then go to the cyclops. Then go to Lockedsabre, get some minotaur fodder allies, then come back here. We get ambushed by a black bear woman, but she is dealt with. The cyclops goes down without a bang, so I prepare for the roc. I actually manage to kill it. Dobar died. I lost my right hand. I also got lucky and got to Lockedsabres before the bogeymen got me. But when I got there. Any help? there is not damage to my legs; my preferences are fine; the speed counter at the bottom says 0.099. I can't do this if I'm slow.